I've remade the Rabbit avatar which was one of my old gifts. 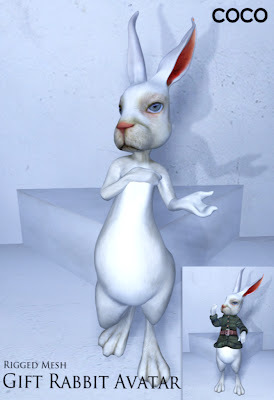 The Rabbit body is a Rigged mesh and the Head is a Non-Rigged mesh. Please use a Mesh enabled viewer to see the Mesh items correctly. Please wear the Rabbit Shape, and add the Alpha to hide your body. This avatar has the original bone position which is different from SL regular avatar. please relog in SL. You will return to your shape. Please visit my store (COCO / DOLLCOCO) and buy it with L$0. I hope you like my Rabbit avatar.